The Clew Bay area and surrounds are a spectacular and exiting cycling arena both for leisure and competitive events such as Gael force. This area is a spectacular cycling area with many marked small cycling roads and local ‘loops’. Besides Trips to Killery Harbour, Silverstrand the the Islands – there is a cycle lane along the coast from Croagh Patrick to Westport that joins up with the popular GREENWAY for cycling and walking on the old railway track to Newport, Mulranny and Achill Island. The Great Western Greenway is a greenway rail trail in County Mayo. It is 42 kilometres (26 miles) long and begins in Westport and ends in Achill, passing through the towns of Newport and Mulranny as it runs along the coast of Clew Bay. It is an off-road trail intended for use by cyclists and walkers. It follows the route of the former Achill extension of the Westport railway line, which was constructed in the 1890s and closed in 1937. An estimated 300 people cycle and walk the trail each day, which was constructed at a cost of €5.7 million. Greenway to Bertra Strand – Work has commenced to bring the Greenway to Bertra Strand past Bertra Lodge ! In 2019 guests can access the Greenway in front of Bertra Strand Apartments to walk or cycle to Croagh Patrick and the Pubs and Restaurants in Murrisk (approx 1 mile away). Furthermore the Greenway is planned to be extended from Westport via Bertra Strand to Louisburgh / Roonagh Quay in the future. 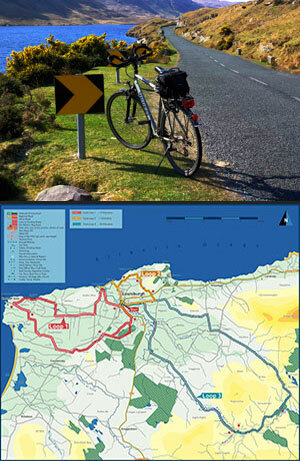 The Greenway from Mulranny leads to Achill Island where the spectacular Atlantic drive can be explored by bicycle. 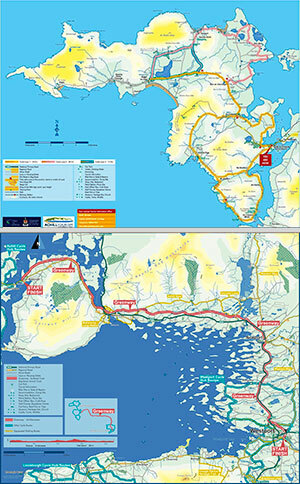 You can also return to Mulranny via the coastroad from Achill Sound. Achill Island (Acaill, Oileán Acla) is the largest island off the west coast of Ireland It has a population of 2,700. Its area is 148 km2 (57 sq mi). Achill is attached to the mainland byMichael Davitt Bridge, between the villages of Gob an Choire (Achill Sound) and Poll Raithní (Polranny). It is believed that at the end of the Neolithic Period(around 4000 BC), Achill had a population of 500–1,000 people. The hereditary chieftains of Umhall were the O’Malleys, recorded in the area in 814 AD when they successfully repelled an onslaught by the Vikings in Clewbay. Explore the landscape on small roads such as trip from Louisburgh to Silverstrand or from Drummin to the Sheffry Hills and along the fjord Killery Harbour. Cycle roads are marked by signposts. Combine a cycle with a picnic on the many spectacular beaches along the way from Old Head to Silverstrand. 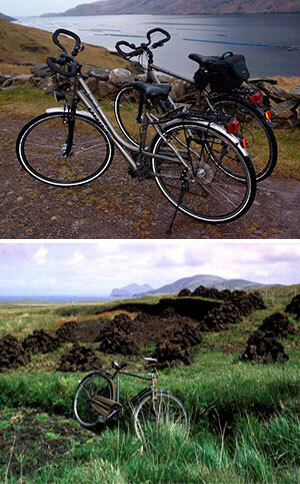 You can also explore the Islands of Inishturk and Clare Island by bike which you can bring on the ferry (Roonagh Quay – a few miles from Louisburgh) or rent on the islands. Inishbofin Island can be reached by ferry from Cleggan off the Leenane to Clifden Road . There are various cycling events in and around Westport. For detailed information and dates please contact the Westport tourist office.